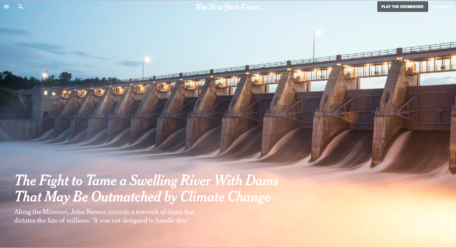 My March 22, 2019 story for The New York Times about the challenges of managing the Missouri River. 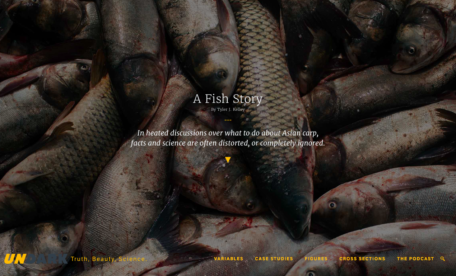 For Undark Magazine, my June 25, 2018 story, Navigating a Sea of Superlatives in Pursuit of the Asian Carp. Araby Kelley and I spent six years making Following Seas, a feature documentary film about one family’s quest to live a self-determined life, and the sacrifices they made to do so. The film was released by Journeyman Pictures and is available on Amazon, iTunes, and Vimeo. 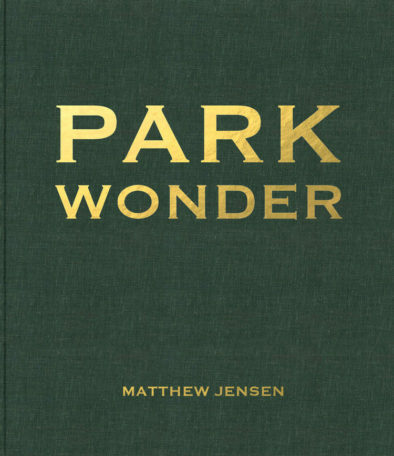 I walked more than 30 miles of the Passaic River with landscape artist Matthew Jensen for an essay that appears in Park Wonder. The book also includes essays by Ian Frazier, Ruth Canstein Yablonsky, Karl Fenske, Hazel England, and an introduction by curator, Mary Birmingham. From the January 14, 2017 show, hosted by Tom Hanks. This segment was built around Need Better Morale in the Workplace? Simulate a Plane Crash, my story for New York Times Sunday Business, January 7, 2017. He was eating Japanese knotweed, a savagely invasive plant that thrives on riverbanks and vacant lots, both of which Pittsburgh has in great abundance. Tougher to eradicate than coal dust, knotweed can grow 6 feet a month in the spring, stand 13 feet tall when full-grown and stretch its roots 15 feet. It even grows through asphalt and concrete, shading out other plants until entire landscapes are knotweed only. Pittsburgh and many areas around it have so much knotweed that businesses are turning it into beer, paper, kimchi, tinctures, ice pops and honey. At least a half-dozen upscale restaurants have served knotweed, which has the texture of asparagus and tastes like rhubarb. The plant’s reputation as a menace only enhances its appeal. “It’s like if you can’t beat it, eat it,” says Valerie Testa, a community gardener and professional landscaper who has unsuccessfully battled knotweed in her yard and neighborhood. Volunteers at Healcrest Urban Farm enjoy ice pops made by blending strawberries and knotweed. ‘Everybody is trying to think of unique ways to get rid of it,’ the farm’s owner says. The bamboo-like plant, with reddish stems and heart-shaped leaves, arrived in the U.S. from East Asia by way of the United Kingdom in the late 1800s. Knotweed was originally admired as an ornamental ground cover—and cover the ground it has. Another out-of-control Asian import, kudzu, is sometimes made into jelly. It was planted for erosion control in the Great Depression but then overran the rural South. Wild Purveyors Wholesale LP, a supplier of local ingredients, sold 260 pounds of knotweed to 13 different customers last year, up from just three customers in 2014, says co-owner Cavan Patterson, 38 years old. Last year’s biggest customer was a brewery that made 15 barrels of knotweed saison, a type of ale. Knotweed sales so far this year total 120 pounds. His price has held steady at about $8 a pound. “Knotweed is an invasive species, and eating it is beneficial to the environment,” he says. The plant grows right around the corner from the Wild Purveyors warehouse, but Mr. Patterson won’t pick knotweed anywhere in Pittsburgh because it absorbs whatever is in the ground. That includes lead from abandoned homes, water from polluted rivers and various toxins from shuttered industrial sites. Otherwise, knotweed is high in vitamin C and a major source of the antioxidant resveratrol. “At this point, it’s getting some infamy. Everybody is trying to think of unique ways to get rid of it,” says Maria Graziani, co-owner of Healcrest Urban Farm in Pittsburgh’s Garfield neighborhood. She blends and freezes the plant into strawberry knotweed ice pops that sell for $3 to $4 each. Across town in the light-filled kitchen of her fifth-generation family home, Christina Joy Neumann set out a jar of knotweed honey that her bees made from the invading plant’s stringy white blossoms. The honey is “Guinness-like, very dark and earthy, smooth and grounding,” says Ms. Neumann, the owner of Apoidea Apiary. Last year, she flew to San Francisco to receive a Good Food Award for her rosemary knotweed honey, which sells for $6.75 wholesale and as much as $12 retail. On a recent foraging trip, Mr. Patterson drove 42 miles to a park along the Conemaugh River in the small town of Blairsville, Pa. He parked at the head of a 1.7-mile trail. Knotweed was the only undergrowth along the trail’s entire length. The stems and leaves seemed to close in around his hiking companion, triggering fears of plague and invasion. Five pounds of Mr. Patterson’s harvest were soon headed for Six Penn Kitchen, where executive chef Kevin Hermann had begun experimenting with knotweed the previous Saturday. “It tastes the way a lemon smells when you squeeze it,” said Mr. Hermann, 35. That night, he served a knotweed-rhubarb compote for dessert. Three days later, he made an entree of knotweed and scallops. Standing under heat lamps in Six Penn’s open kitchen, Mr. Hermann tore the leaves off the knotweed and diced its shoots into thin cylinders, sauteing them with mushrooms. He served that over the scallops with celery root purée and a watercress salad with red wine mustard-seed vinaigrette. For a private event the next day, he used knotweed shoots in a sauce over oysters. “I love cooking with things people can’t just go to the store and buy,” he says. Now that Mr. Hermann cooks with knotweed, he notices it everywhere. On an unseasonably warm midwinter day, Stephanie LaRose Lewison arrived at Fall Kill Creek in Poughkeepsie, N.Y., with hip waders, a ladder and white ski poles. After descending the ladder into the creek’s swift current, she balanced herself on the poles and began bricking. “It’s a defining characteristic of myself,” said the 31-year-old geologist, of her passion for collecting the ubiquitous fired-clay blocks almost universally regarded as heavy, dirty and generally worthless. To date, she has amassed more than 400 bricks—not far from the proverbial ton—in her Poughkeepsie basement. Like other collectors, she looks for bricks stamped with words, pictures, symbols or numbers set in a rectangular recess called a frog. Unmarked bricks, called “vanillas,” are usually ignored. Ms. Lewison is member No. 1,518 of the International Brick Collectors Association. The organization, which frowns on buying or selling, won’t assign bricks a monetary value. It insists that one brick is worth another in trade only. Mr. Graves, 73, has between 3,000 and 4,000 bricks in his yard in Wichita, Kan.
“I don’t mind being called crazy,” he said. Instead of searching eBay, IBCA members travel to thrice-yearly swaps where collectors trade from truck beds and spread out bricks to give away. A bell rings and attendees race around, filling their arms. “It’s amazing what people are willing to share,” said Ms. Lewison, who said she once scored a rare New York Central Railroad example. Between swaps she mails bricks to collecting colleagues in flat-rate boxes. In the early 1900s, the Hudson Valley led the world in brick production. New York City building codes mandated fireproof materials, and vast deposits of clay lay within a short boat ride of the growing metropolis. But regulations changed, the Depression hit, and construction firms turned to concrete and steel. Of the 100-plus brick manufacturers that operated along the river in 1910, none remain today. Now collectors scavenge river banks, former brickyards, constructions sites and landfills for the industry’s remains. Much of that history is preserved in the 3,000-strong New Netherland/New York Brick Archive at Fordham University, maintained by Allan S. Gilbert. The anthropology professor uses chemical analysis to compare bricks from dig sites with ones in the archive. Calling the humble brick a crucial artifact in the history of urbanism, Mr. Gilbert said he is “awed” by its significance. The amateur scholarship of these two brick buffs has exceeded the published literature on bricks. Now they are correcting the texts and advising other collectors on forums like brickcollecting.com. The two friends pore over old maps, obituaries and industrial records to find out what company made what brands, where the brickyard was and who owned it. They have solved the mysteries of Shamrock, Dwyer, Roberts and about 400 others. A few brands, such as *DK* and VF, still elude them. Mr. Van der Poel’s favorite brick is unmarked, except for the tiny footprint of a child who stepped on the clay before it was fired. On one brick hunt, they did find a corpse. “It didn’t look gory,” said Mr. Rieck. “A cowboy boot with a pant leg coming out of it. A skull like it was just planted in the sand.” They took their bricks home, then called the sheriff. It turned out to be someone who had been reported missing months before from a nearby beach. Mr. Van der Poel said he once knew a collector who tried to pry a desirable brick out of a stranger’s front steps. “I’m not going to take a brick out of somebody’s house,” Mr. Van der Poel said. He and Mr. Rieck do have their strategies, but the duo are careful to ask permission, when there is someone around to ask. The best time for bricking comes after the snow melts because ice shifting along the Hudson’s shoreline can uncover fresh examples. Another choice time, said Mr. Rieck, is right after a fire. “It legitimizes us,” he said. Listen here to a radio piece by by Antonia Cereijido for NPR’s Latino USA, September 11, 2015. Companion piece to my Christian Science Monitor story In New York, Mexico’s richest immigrants lend hand to their countrymen. Both produced by Round Earth Media. ERIK MICHELSON BARELY glanced at the gorgeous views from Breakneck Ridge, views many New Yorkers give up a precious Saturday to see. As he scrambled past hikers on a recent spring afternoon, he had eyes only for the trail and the feet that may or may not stay on it. Mr. Mickelson designs trails full-time for the New York-New Jersey Trail Conference, which maintains more than 2,000 miles of free trails in the region. His job: to get inside hikers’ minds and anticipate their movements. “They vote with their feet,” said Mr. Mickelson. An hour and a half north of Manhattan, Breakneck Ridge is one of North America’s most popular day hikes, in part because the Metro-North Railroad stops right at the trailhead just north of Cold Spring, N.Y. All a visitor has to do is follow the small squares of color, called blazes, into the woods. At least that is the idea. “Laying a trail out is part art, part psychology, part science,” explained Mr. Mickelson, 44. Wearing insect-repelling pants and a backpack sprouting a drinking-water hose, he spends nine-hour days hauling his tall, angular frame through brambles and brush, scouting trails that independent-minded hikers will adhere to. Problem is, if a path doesn’t take day trippers to an overlook or waterfall they want to see, they will create their own “social trail,” increasing the human impact on the land. To thwart this, Mr. Mickelson tries to anticipate renegade footfalls. “You’ll lay it out, you think you’ve done it well, and then they make a shortcut and you’re like, ‘Damn, why didn’t I see that?’ ” he said. Social trails occur, for example, when a hiker sees the next leg of a switchback below, then cuts down the hill to shorten the distance. On a busy trail like Breakneck, people will also walk around one another, widening the path. To discourage these two-lane tendencies, Mr. Mickelson will cleverly guide a route through steep rocky terrain, along cliffs or between boulders. Peter Jensen, president of the Professional Trail Builders Association, said sustainable trails are more enjoyable because they go unnoticed. A muddy or rutted one forces walkers to focus on their feet instead of what they came to see. Every year Mr. Jensen’s 90-member organization adds eight or 10 new trail-building companies. “Right now trails are hot,” he said. Growing up in Virginia Beach, Va., Mr. Mickelson cared most about surfing. But when the waves were flat, he hiked in the woods behind his house. After receiving a degree in plant science from the University of Arizona, he spent 10 years in the golf industry. He tried teaching for a while, he said, but decided he needed to be outside. Mr. Mickelson’s trails follow the rolling contours of a slope with a gentle sense of momentum. But to keep what he calls “that East Coast flavor,” he includes occasional steep “punchy” rock sections. One of Mr. Mickelson’s worst enemies is water. He thinks about it constantly, looking for its source, predicting its movements and determining how a path can be laid out or adjusted to minimize erosion. A poorly planned trail becomes a stream bed during heavy rain, carving the hillside as it descends. Hikers contribute, too. Last year Breakneck Ridge saw more than 100,000 hikers, 1,426 in a single day. Each foot takes a little of the mountain with it. How people descend from the ridge is one of Mr. Mickelson’s current concerns. One descent is overused and eroded, and the other has hikers walking back through a dark, shoulderless highway tunnel. He proposed a new descent that would shorten the current three-hour loop. State biologists denied the plan, saying it took people too close to protected habitats, like rattlesnake dens. Daniel Yu, 40, a technology consultant from Brooklyn, spent a recent afternoon turning over half-ton rocks as a Trail Conference volunteer, seemingly oblivious to what lay beneath. Nearly 3,000 hours of volunteer labor by people like Mr. Yu went into building the Appalachian Way, a 1,777-foot-long trail segment 11 miles from Breakneck. Meticulously designed by Mr. Mickelson, it required jack-hammering bedrock and laying 27 stone steps. “It takes me three minutes to walk by something it took two weeks to build,” mused Mr. Mickelson. Volunteer Kevin Stamey, 60, a former systems analyst for Goldman Sachs, is also struck by the longevity of trail work. The infrastructure he built at Goldman is gone, he said, upgraded beyond recognition, but his trails could last 100 years. “The permanence gives you an emotional stake,” he said. As a tugboat captain for Great Lakes Towing, his job is to help freighters navigate the swift currents and low bridges of the Detroit and Rouge rivers. But from April to July, it is a struggle just to manage his own dock amid the flocks of ring-billed gulls that annually descend on his workplace. Mr. Heaney remembers when this stretch of waterfront was occupied by the Detroit Marine Terminal. He used to tow ships to the terminal, long abandoned. Now gulls nest where cargo and gantry cranes stood, and wheeling birds have replaced bustling stevedores. “It’s like National Geographic right there on our working dock,” says Lindsay Dew, Great Lakes’ director of operations and compliance. On a recent Saturday afternoon Mr. Heaney, 59 years old, looks across the 300 feet of concrete dock standing between him and his tug, Wyoming. The pavement is layered with bones and guano. Eggs sit on bare ground, ringed by feathers and grass. The air smells sharply of ammonia. Acting engineer Scott Rosseel, 32, is the first to attempt the gull gantlet, flapping his arms as he stalks to the boat. Mr. Heaney and deck hand Jeff Davis, 62, follow, baseball caps pulled low. All three tiptoe with eyes on the ground, taking care to avoid eggs. As they advance, chicks hop away frantically and enraged parents screech warnings from the air and commence divebombing. “You keep agitating them,” Mr. Davis scolds Mr. Rosseel. “Be one with the gull.” Mr. Rosseel’s approach is rewarded with several white splotches on his blue work shirt. When they finally reach the red and green tug, Mr. Heaney says, “it is completely whitewashed with guano.” Mr. Davis makes a pot of coffee, then grabs paper towels and Windex to clean droppings off the windows. About 20 birds stand on the 86-year-old boat. A nest in the bow contains two brown-speckled blue eggs. The gulls are a stubborn lot. And it is illegal to kill them; even their feathers are protected under the Migratory Bird Treaty Act. But for all the annoyance, crew members have grown protective of the gulls. Jay Downen is port representative for Great Lakes Towing, which owns the tugs. He stopped mowing the weeds on the dock because he didn’t want to harm the fist-size gray chicks nestled in them. He also marvels at the birds’ pluck. When called to work at the Detroit dock during gull season, the crew knows to park their cars under a protective carport. They keep a broom handy for the Fleet Captain to shoo birds away when he visits. The dock’s location is ideal—near the confluence of the Detroit and Rouge rivers, in the industrialized “downriver” area where most freighters call. According to Robert Burns of the Detroit Riverkeeper Program, part of a national water-quality group, the gull colony had been on Fighting Island in the Detroit River for decades until the landscape became overgrown. It moved to nearby Nicholson shipyard, where employees got rid of it by building a house for a family of neighborhood foxes. Around 2012 the gull colony found its current home, conveniently located across the street from 9300 W. Jefferson Ave.—a 123-acre wastewater treatment plant. There, the gulls dine on algae and scum skimmed off the open-air tanks. The noise from the Jefferson Avenue colony is constant, anxiety-inducing, and loud enough to prevent conversation below a yell. Casting off, Mr. Heaney pulls a lever to sound the tug’s horn. The gulls bolt en masse into the air. “It looks like the whole earth rises up,” says Mr. Downen. The captain steers Wyoming down the Rouge and into the Detroit River to meet Sea Eagle II, an integrated tug and barge that carries cement. One additional passenger, too young to fly away, runs laps around the pilothouse, passing the open door at regular intervals. Mr. Downen watches a gull sitting mockingly on a plastic owl—a faux figure that often frightens birds away. “These Detroit seagulls don’t get scared by much,” he says. Last year he tried using something called a Bird Xpeller Pro, a squawk box that imitates seagulls in distress and birds of prey. Mr. Heaney says it may as well play Frank Sinatra or “mood music,” because the noise only seemed to encourage the gulls, which average three clutches a season. At the dock, the gulls settle back down, oblivious to the humans and their boats. “[The crew is] trying to find that equilibrium, to not harm the birds and do their jobs,” says Mr. Dew. The gull situation definitely requires extra manpower, he says—like time spent cleaning the tugs. 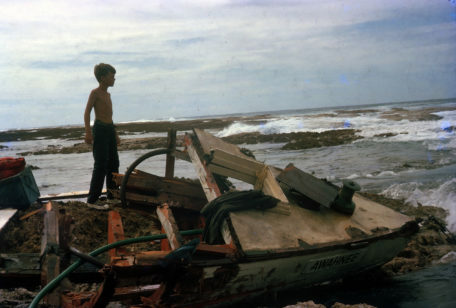 For an image-oriented company like his, Mr. Dew says, it is “embarrassing” to be seen with guano-covered boats.